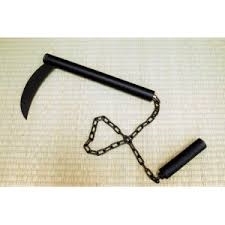 Kusarigama is a weapon that has a sickle and a weight and looks very complex. They are connected with a chain. The length of the chain is about 1000-4000 mm. To use it, the weight was thrown at the enemy’s weapon to drop it or used to coil the weight around an arm or the enemy’s weapon with the chain. After that, a finishing blow was dealt with the sickle to the enemy. 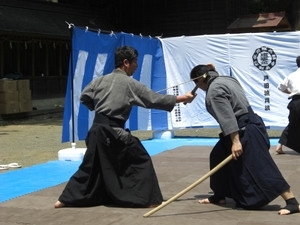 The methods of using Kusarigama are so varied that users can attack in any way using a combination of a sickle and a weight. It depends upon the ability of the user. Unlike shuriken, kusarigama is not necessarily a weapon only for ninjas. It was originally a self-defence weapon for people who were not permitted to have a Samurai's sword, like farmers, craftsmen, and merchants. But Kusarigama are so compact that a man can bring it concealed inside of his clothing so ninjas especially liked to use them. But Kusarigama demanded users a good use of technique to use freely and was specialized only for attack. It can be said that Kusarigama is the right weapon for Ninjas who have superior ability in body use. There are a lot of types of Kusarigama. I am going to explain about those in detail. Firstly, a noticeable point is that there exists a type whose sickle is double‐edged. With this type of Kusarigama, a ninja could have a second attempt at attacking even if he missed with the first blow at his target. Of course originally kusarigama had been a simple agricultural implement, but in this case, it is the result of being manipulated into a specialized weapon. An unusual variety is a type of " Nunchaku " . You probably know that Nunchaku is a weapon from Karate or kung‐fu. It consists of two heavy sticks connected by a chain or a rope. We can see this weapon in the films of Bruce Lee. The length of the chain of the weapon is much longer than that of Nunchaku. It is believed that there are two ways of using the Kusarigama. One is that a Ninja uses two sickles for a raid. The chain may have been able to be used for defence. The other is that the ninja throws either sickle like a weight and after that he attacks with the finishing blow with the other sickle. Although a Kusarigama of this type must have had a stronger destructive power than the usual one, it demanded excellent skills to utilize this weapon. 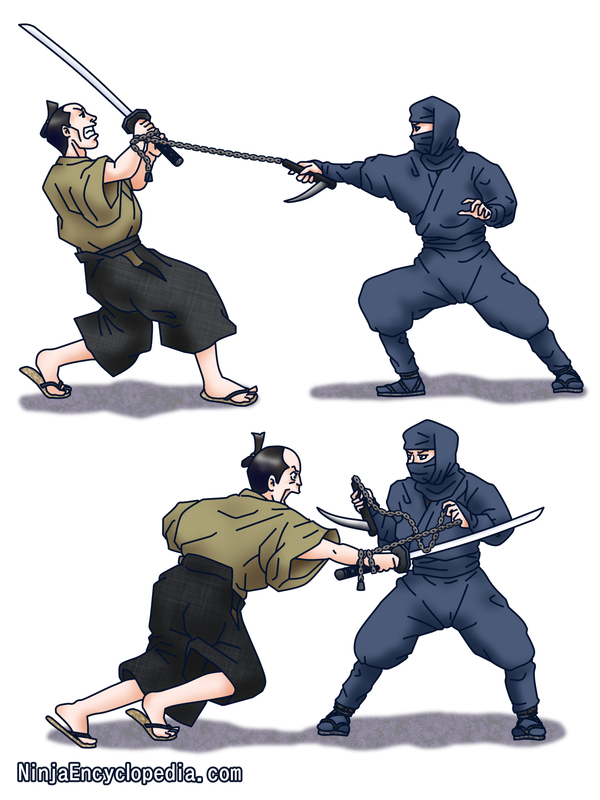 It is thought that the inventor of Kusarigama is not a ninja and that it spontaneously appeared as a weapon from the people who were prohibited to have a Samurai-Sword with them as a self-defence implement. It’s possible that Ninjas adopted the weapon as their hidden tool. One thing we know is that kusarigama was not used in war because kusarigama can be used to deal with only one or at most two opponents. Almost of all Kusarigamas which are left at present were casted by ordinary blacksmiths, not by Sword-craftsmen. This fact means that Kusarigama was not a main weapon for Ninjas. Further to this, the users of Kusarigama were not necessarily only ninjas, but also samurai who also learned how to use Kusarigama. 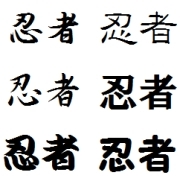 The evidence is that Kusarigama-jutsu (鎖鎌術 - the technique on how to use Kusarigama is included in the " Bugei-juhappan (武芸十八般) " - this means the 18 skills which Samurai must acquire in the Edo-period. The way of using Kusarigama was systematized into one of the Japanese martial arts. Today, people can learn Kusarigama-Jutsu in many ways, such as a martial art, a sport, or an amusement all over the world.